4 camere da letto, bagno completo, cucina, sala da pranzo, soggiorno, veranda, spiaggia privata e dock. Il cottage WELIKIT si trova sul lato est del lago Swan a Searsport. La nostra casa è stata costruita nel 2009 con pavimenti in rovere, arredamento antico e lampadari di corna di cervo. 2000+ sqft ospitare fino a 12 ospiti. 4 camere da letto, 1 bagno. Cucina completa e tavolo della fattoria. Il primo piano è aperto. Puoi vedere il lago mentre cammini dentro. Soggiorno ha divano in pelle e reclinabile in pelle e un futon full size. DirecTV e WIFI disponibili. Due camere da letto al primo piano con un padrone del lago regina e una doppia. Un bagno completo con vasca-doccia, lavatrice e asciugatrice. La camera da letto al piano superiore ha due gemelli e futon matrimoniale. DirecTV è al piano di sopra pure. Al piano inferiore dispone di un salotto privato e un letto matrimoniale. Questa è una camera da letto con accesso diretto al lago. Il portico con scala a chiocciola conduce a un patio roccioso all'aperto e a una griglia in mattoni a legna. Un sacco di erba per giocare i giochi cantiere. Goditi il bellissimo giardino perenne di Lori. Rilassati sulla tua spiaggia sabbiosa. 140 'di lungolago privato con darsena. Portare la propria barca. Canoa e kayak forniti. Goditi il secondo lago più grande della contea di Waldo e splendidi tramonti! ampie viste del lato ovest. Grande pesca !! Eagles, svassi, anatre ogni giorno. Questa casa vacanza è stata resa possibile da Pearson Vacation Rentals. Beautiful and peaceful vacation spot, loved it! Cottage and lake were beautiful, just like the pictures showed. Supermarket close by, so don't need to bring food with you, can shop when you get there. Great dog park nearby as well. Both about 15 minutes. Only disappointment was receiving a contract 2 days before our stay with additional stipulations, these should have been made known up front. Turns out, none of them impacted us, but still was not happy with that. We just returned from a week stay at WELIKIT Cottage. 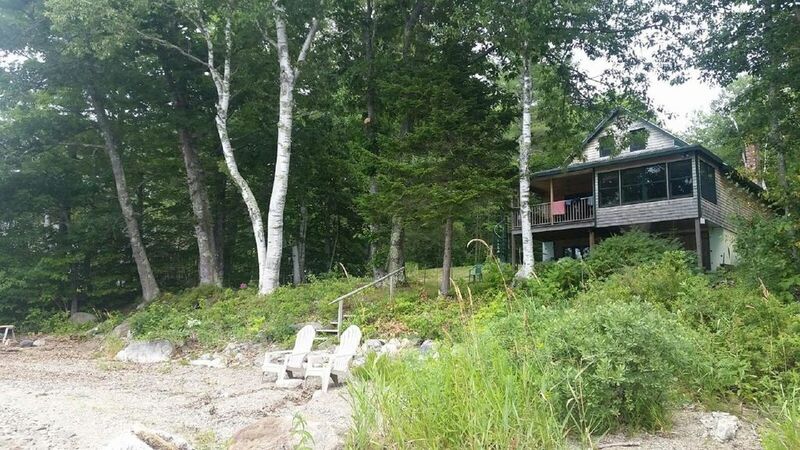 The cottage is on a peaceful lake and provides a true sense of privacy. Location could not have been better. Coastal town of Belfast is only minutes away. The cottage was very comfortable, well-kept and outfitted with everything we needed. There is a grocery store at the southern tip of the lake that had a nice variety of groceries/household supplies. Thank you Ben for making your cottage available and hope to visit again in the future! Welikit Cottage is a lovely camp on beautiful Swan Lake. We come to this special place twice per year and hope to continue this tradition for many years. Lori and Ben Pearson are gracious hosts and have prepared this cottage with every comfort for a relaxing stay. Sleeping up to 12 people, everyone has plenty of space and privacy. We loved our relaxing time on the porch looking at the lake or sitting in the heavenly hammock chairs swinging gently in the open air listening to the loons on the lake. The lake is just a few feet away from the cottage and so easy to jump right in and enjoy. We sun bathed right on the dock and enjoyed a stroll down to the dock in the evening to watch the magnificent sunsets. After all, the cottage is located on Sunset Lane! There is a canoe and two kayaks which we loved exploring the lake. The beautiful windows in the cottage span the width of the home, so you can always see the lake. The kitchen has everything you will need for your stay complete with a dishwasher, too. A beautiful large wooden country table sits on beautiful wide plank hardwood floors which Ben laid himself when helping to build this cottage in 2009. Ben and LoriPearson are a phone call away should you need anything during your stay. They open their home to you and want you to have a wonderful time. “Welikit” very much there, but most of all we love it! I spent a week waking to the sound of birds calling for each other in the trees, beautiful sunrises, the warm summer wind moving through an open window and the lake water lapping against the shore. Sitting on the porch sipping tea or a glass of wine and watching the breathtaking sunset made the evening a delight. Days were filled with exploring Searsport and surrounding areas, treasure hunting for antiques, walking along the ocean beach and visiting the Cellar Door Winery. The house was lovely and inviting with a "welcome to your home away from home" feel. Sitting areas in and outdoors were cozy and placed through the house in positions that would allow great conversation. The kitchen was easy to work in and had all the needed equipment to prepare whatever feast you wish. Grilling on the porch was so peaceful. We even had a snapping turtle come to visit the front yard. All in all, one of the best vacations I had ever had. Thank you for my much needed breathe of fresh air! Perfect location and beautiful sunsets! Everything was perfect! The cottage was just perfect for our friend's 60th birthday celebration Very clean and everything as described. Ben and his mother provided water and great muffins second morning of stay - what a nice surprise. The open porch on second floor was awesome as well for dogs and relaxation. Will definitely come back! Thank you again! Just wanted to get away for a relaxing long weekend with family and friends and we could't have picked a better spot. the house was rustic and had everything we needed.we picked the perfect weekend it was beautiful weather enjoyed the outdoor activities. We used the kayaks, and the ride around the lake was beautiful we have never seen a better sunset. We used the fire pit the entire weekend thank you for the wood. We enjoyed the ten minute drive to the ocean and the lobsters we picked up on the way back to the house were amazing. Everyone agrees we would love to go back.Thank you for our complementary muffins they were delicious. e 2 ore a Baxter State Park e Mt. Katahdin.